BOOKS of condolence are to open following the loss of five members of an extended family in a drowning tragedy at Buncrana Pier on Sunday evening. 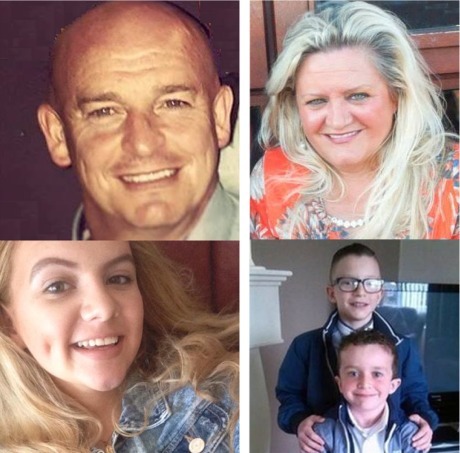 Those who died were Sean McGrotty, 49, from Derry; his sons Mark, 12, and Evan, 8, his mother-in-law Ruth Daniels, 59, and Ms Daniels' daughter Jodie Lee Daniels,14. Mr McGrotty's four-month-old baby daughter Rionaghac-Ann was rescued at the scene and is said to be doing well in hospital. His wife Louise, who was at a hen party at the weekend, is being comforted on her immense loss by family and friends. She has been to see her baby daughter at Letterkenny University Hospital. The tragedy unfolded after Mr McGrotty's 4x4 got into difficulty on the slipway of the local pier and slid into the deep tidal water shortly before 7.15pm. It had earlier been a beautiful sunny day that saw scores of daytrippers and anglers make their way to the seaside. Emergency response teams attempted to resuscitate the victims at the pier but the five were later pronounced dead by a local doctor. Lough Swilly RNLI Lifeboat operations manager John McCarter said: "Our volunteer lifeboat crew were one of the first emergency services on scene and recovered the five casualties from the water. We were devastated to learn subsequently that those five people, including young children, had lost their lives. We wish to commend the actions of the member of the public who selflessly entered the water and rescued the baby and we wish them both a full recovery." Mr McCarter added: "While our volunteer lifeboat crew train for and respond to every possible incident, the events in our community last night, were extremely tragic and challenging for our lifeboat crew. Our thoughts are now with the families who have lost loved ones in this awful tragedy." Among those who also took part in what was one of the area's largest air and sea emergency responses were Greencastle Coast Guard; a Coast Guard helicopter crew; Gardaí and the local fire service. Emergency teams from Derry also responded. Donegal County Council will open a book of condolence at its offices at St Oran's Road, Buncrana. Cathaoirleach Cllr Ciaran Brogan extended his sympathies to the bereaved families and praised the "valiant efforts to save the lives" of the victims. The Mayor of Derry Cllr Elisha McCallion will open books of condolence at St Joseph’s Church, Galliagh and Holy Family Church in Ballymagroarty following the tragic incident. Funerals for the deceased will take place at Holy Family church in Ballymagroarty in Derry on Thursday at 2pm.